Shop Fender Custom Shop Guitar Tool Kit by CruzTools from AMS and enjoy Fast & Free Shipping. A convenient collection of all the necessities for maintaining your Fender Electric, Acoustic or Bass guitar for optimal performance, the Fender Custom Shop Guitar Tool Kit offers includes a variety of tools including 4-in-1 screwdriver, hex wrenches, ruler, diagonal cutter, capo, feeler gauges and guitar string winder to cover your basic needs. 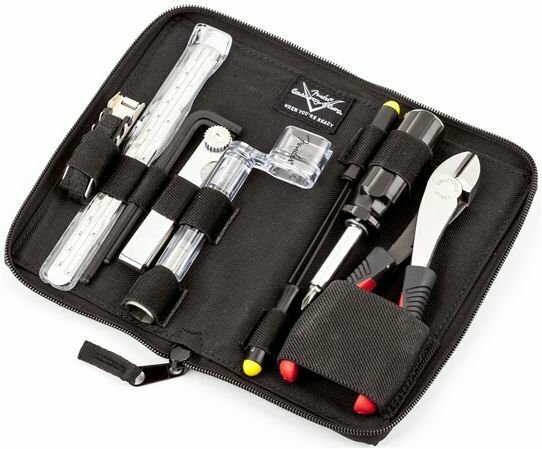 The included tools are the same high-quality setup tools used by the pros and come complete with a polyester storage pouch you can carry with your instrument at all times. Worth the money. Very handy when the unexpected shows up at work and you need to fit it quick. The capo is just garbage for one thing. The rest of the tools you could find in most tool sets. The winder is cheap plastic. The feeler gauges have the writing rubbed off. I'll be returning this for my money back bc it's god awful. Borrowed one... now MUST buy!!! Borrowed a kit from a friend and absolutely loved it! Extremely convenient. Has everything I needed in a compact package. Cant wait to get one myself! Being disabled with MS I am stuck at home alot and the guitar is my outlet and peace of mind/soul. Plus my finances are VERY limited. Using a kit like this to do my own repairs and work will be very helpful. Cant wait until i can gather some funds and buy one myself! !